I have asked here before and not got very far, but I am trying to find out what is known about the Bucolo family. the 'Bucolo Made in Italy' label. Was this label normal for Horace Bucolo instruments? I have recently been offered a very nice mandolin with the same label, does this mean it was made by Horace Bucolo? I also have a guitar with the label inside 'P. Bucolo - Catania' and have seen others like this, usually a lot cheaper than those credited to Horace. I know there was a Bucolo family active in Catania, which is where Horace also came from, so, are they related, Horace and P. Bucolo? And if Horace was active in Paris, why does the label say Made in Italy? I had read somewhere that Symphonia was an Italian retailer, and applying a 'Made in Italy' label was a trick to avoid import tariffs on guitars made in France, is this the case here? 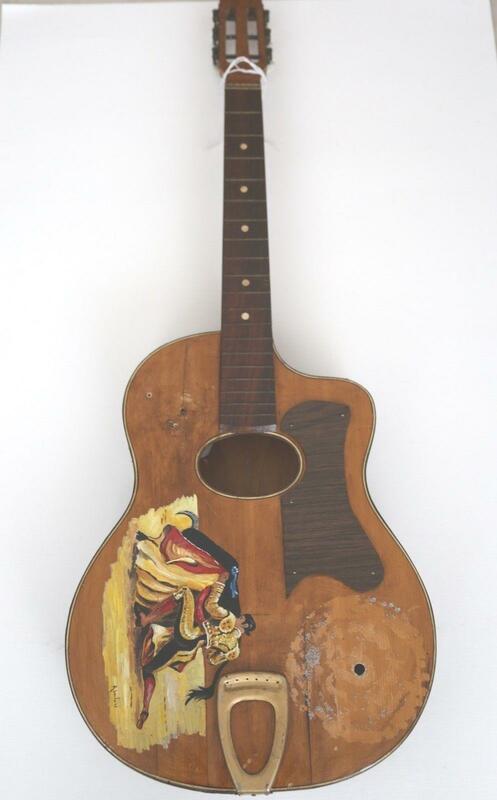 A general Google search showed no mention of mandolins by either Bucolo, which as they were from Catania seems strange, so this one would seem to be quite rare. Any info, or leads would be appreciated. As a further update on that, I have since read that Jean-Pierre, a guitarist famous in France for collaborating with Johnny Halliday and Renaud, is the son of Horace (not Pierre) but I have still not been able to find a contact for him. Horace did make guitars for the retail shop Symphonia on the Boulevard Magenta in Paris. Both Horace and Pierre have been listed as working at a Paris address on rue Keller. As they both came from Catania in Sicily it would be fair to guess Horace was originally Horacio and Pierre probably Pietro as it was the custom for the Italians who settled in Paris to take a French version of their name. In the excellent and interesting interview with Pierre Fontaine in ‘Vintage Vertigo’ he explains how Pierre Bucolo was one of his best customers, so as well as making the bulk of the Busatos from the mid-fifties Fontaine was probably also making many guitars for Pierre Bucolo. Now it gets confusing as there doesn’t seem to be a definitive recognised label for guitars by Horace Bucolo although as he was known to have made guitars for Symphonia there may be some Symphonia guitars that have been erroneously attributed to Horace. There were some attributed to P. Bucolo often with the added Catania and others which just say either Bucolo, or Bucolo Made in Italy but interestingly while these often seem to share similar fonts and ink colours it is not clear whether they are all coming from the same source or not. Whatever, there have certainly been many guitars advertised in the past, and often still are, particularly over at LeBonCoin, where the obviously cheaper looking base models (probably by Fontaine for P. Bucolo) have been for sale as Horace Bucolo instruments, whether this is just from hearsay and ignorance, or a deliberate attempt to add value because Horace had a reputation as a bona fide luthier while Pierre may have been just a wholesaler is not clear. Little else is known and my investigations continue, but if anyone has anything to add, please do. And this is my P. Bucolo. Cheers Chris I'll get back in touch once my new wreck/guitar arrives. p.p.s I've asked the guy selling the Bucolo on ebay.fr for some more pictures. I don't know how much more you're gonna get, you're pretty much the authority in the matter as far as this forum goes. I do like reading about your findings and speculations as to how things might've been working. There was a pretty well researched and written story about Bartolo Busato in the Fretboard Journal, issue 34. I wonder if the writer might know something about Bucolo subject? I think I gave away my copy so I don't know who wrote it. Hah, well I wouldn't claim to be an 'authority' on the Bucolos as all I have done is put the known speculation into to some possible order. Francois Charle and Arnaud Legrand in France have probably done more hands on research than most into the mysteries of the many French/Italian luthiers but even they have published little on Bucolo ( H or P ). I will continue my efforts to find a contact for Jean-Pierre Bucolo as he may know more, although somebody did tell me Horace died when he was still an infant and he does not remember much. 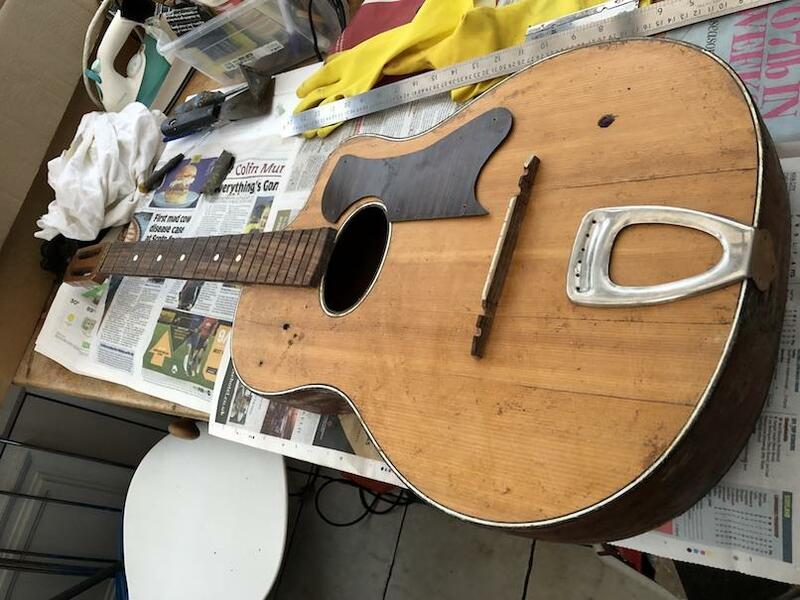 The problem now is that while most of the original luthiers, craftsmen, workers, assistants and even retailers involved from the key period of the 1930s to the '50s have passed on there a few living witnesses left to tell who did what and when. Which is why the Pierre Fontaine interview in Vintage Vertigo was so important. Although the Busato name will add huge value to any instrument Fontaine tells quite clearly that by the early '50s Busato himself was no longer making guitars, but I suspect there are yet other myths that will never be clarified. I never saw the Fretboard Journal feature but I wonder was it by chance an English translation of the feature written by Legrand on the French GuitareMag.com website in which he explains that by 1952 as Busato had expanded his various business interests he sub-contracted out most of the guitar making to various French and Italian luthiers in the Paris region and even the top line Selmer style guitars were, after 1952, made by Pierre Calza, but often had a label signed by Busato. It was in this report that Legrand also lists Jacques Favino, Pierre Anastasio and Pierre Bucolo all as former craftsmen employed by Busato in the 1940s and early '50s period. Thanks for posting that Andy, I saw that one listed on ebay a few months back in UK. I seem to remember a rather optimistic asking price for something needing so much work. Didn't it also have a hole or damage on the back? Anyway, it is already looking a lot better, keep us informed how you get on. I must admit to having got distracted by so many other guitars, I have made no progress on mine, maybe this will spur me on. Still trying to find more on P. Bucolo too. 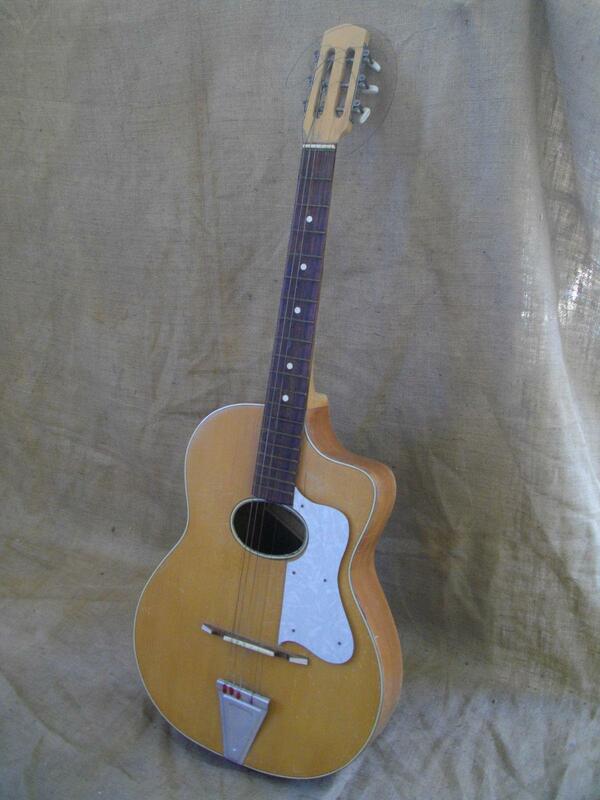 Cheers Chris, I paid less than half the asking price, I want to teach myself some gypsy guitar restoration skills. Holes in the plywood back should patch ok, worst issue is one top brace cut in half. A.
Andy W jeez what a car crash that looks like.